As I'm sure most of you have heard, the Mariners signed catcher Ronny Paulino to a minor league deal. At least, that's what has been reported. We don't know for sure because the deal hasn't been made official. If that's the case, whatever. Paulino won't be anything more than a backup for Jesus Montero. That's frightening on several levels. While I'm at it, I've calmed down somewhat since the last post in regards to the Mike Morse trade. I'm still not thrilled with it, but only due to the fact that it weakened an already weak position and placed another player on the OF/DH/1B pile when the pile is getting close to collapsing in on itself to begin with. Even so, the bulk of the pile is second division starters, fourth outfielders and guys that have done nothing to prove themselves thus far. And yes, I'm looking at you Justin Smoak. We'll delve into all this wonderful stuff after the jump. First, Ronny Paulino. Do I think it was a bad signing? No. Do I think it was a good signing? Only because of the fact there's one catcher currently on the roster. Jeff Sullivan did a post on it over at Lookout Landing, so I won't go in to details on his stats and all that. Considering the other options they could've signed at catcher, Paulino was a surprise. We'll see what happens with him later in the spring, but this was a roster move rather than an offensive one and I have nothing to add to what Sullivan already wrote. Go forth and read. As I mentioned in the previous post, I was not thrilled with the trade that sent John Jaso to the Athletics and brought Mike Morse to Seattle. After having had time to cool off and take a closer look, I'm still not thrilled with it. Morse has his weaknesses, but it was a move to shore up the offense when offense is needed. To go more in depth on it, the current roster construction is what has me concerned. 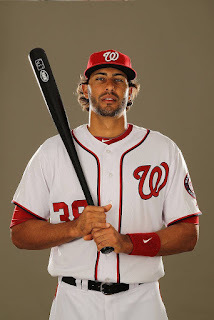 For starters, the outfielders on the 40-man roster are as follows: Jason Bay, Mike Carp (barely), Guti, Raul Ibanez, Julio Morban (non-factor at this point), Mike Morse, Carlos Peguero (haha), Michael Saunders, Eric Thames and Casper Wells. That is not an outfield that would strike fear into a kitten, maybe. We don't know how the fences will play this coming season and it may turn out that these guys may turn out to be decent. Saunders has had one good year, so let's not hang our hats on him just yet. And Guti would have to stay healthy, which means wrapping him in bubble wrap and placing him in a padded suitcase when they travel to away games. For home games, they'll have to pad his locker so he doesn't get a splinter and for safe keeping overnight. We know what the Mariners would be getting with Wells, Thames, Morse, Ibanez and Bay. None of those other guys have given any indication they can be consistent or stay healthy. Thames and Wells may end up being platooned, but if Guti is healthy, you have Guti, Saunders and Thames/Wells in the outfield with Morse at first. With Morse at first, Kendrys Morales at DH if Montero is catching, but where does that leave Smoak and Carp? Has that experiment been tested completely and one will serve as a backup with the other in the minors? And if Montero is DH'ing, where do you play Smoak, Carp or Morales? And if one of these guys goes down, do you play Ibanez in the outfield full time and hope he can still hit? Or Bay? Peguero? A lot of players on the roster does not mean you're in a good position and the flexibility is minimal. There are a lot of questions left unanswered, and that's strictly the OF/1B/DH situation. The infield situation is worthy of a face palm. Not because they won't produce or can't produce, but because there's no depth there either. You have Justin Smoak/Mike Carp/Mike Morse at first, Montero behind the plate, Dustin Ackley, Brendan Ryan and Kyle Seager. That's not a bad infield, really. Ryan can more than make up for his lack of offense with his glove and Ackley was injured most of last season and may bounce back. Seager doesn't need to improve, but if he does, look out. There are options for backup infielders, with one of them being Robert Andino. Remember the Mariners traded for him, sending Trayvon Robinson to Baltimore? I'm honestly surprised I did. If any one of those guys goes down with an injury, who fills the spot? Whoever does fill it will be a step or five down offensively from the regular that gets hurt. If Ryan gets hurt, its closer to even, but the Mariners would still miss the glove at shortstop. If it's a rookie, you put him in the lineup, cross your fingers and hope you don't destroy his confidence. You can look at the roster yourself and see what's going on. I get the Mariners needed offense and if it was a guy like Upton, I couldn't care less who got sent down or cut. Not only because he's a young guy who has a few years left on his deal, but because he'd be worth watching. With Morse, he's a guy on the wrong side of his prime with one year (2013) left before arbitration. He'll be a free agent at the end of the year. I'm not entirely convinced that trading Jaso and his positional value is worth a year of Morse when the team doesn't look all that strong, especially compared to the rest of the AL West. It's entirely possible I'm wrong and the Mariners end up winning 100 games next season, but you can't count on the improbably happening every single year either. The offseason isn't over yet, so there could still be things happening behind the scenes. I'm also not saying 2013 will be another bleak year for the Mariners. I'm saying the possibility for a big hit injury-wise is higher than any of us would like to admit. 162 games over 6 months, injuries happen and below the surface, the Mariners aren't there yet. Nick Franklin may break camp with the team and put Ryan on the bench or on the way out, hit a ton and give us some semblance of hope again. It's not going to take much, but it's still just this side of scary for the upcoming season. The fans are screaming for offense and Jack Z delivered the best he could with what he had at his disposal. Desperate times and all that. Let's just hope the desperation doesn't come back to haunt them.